The constant news about the election is a great reason to find a healthy way to let go of any political stress that you are feeling. The angry words spoken by candidates and then repeated in a relentless news cycle can take a toll on your own emotions, even though they are the emotions of someone else. News is only one source of possible political stress for you. Your friends, coworkers and family members may have strong opinions about their own political views and they want to discuss them with you. Not only do they want to discuss their views, they also want to convince you why their candidate is the one you should be voting for. Maintaining your composure in the face of political views that conflict with your own is a challenge, but one you can handle with grace. 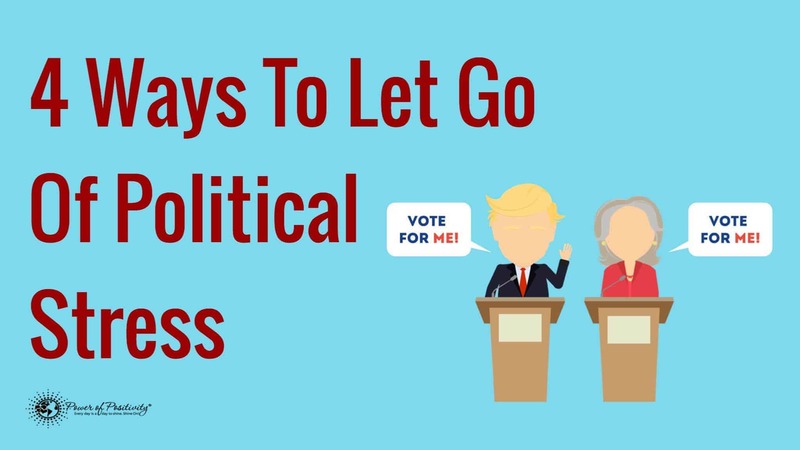 Let’s look at healthy, positive, and socially conscious ways to let go of political stress and respond to contrary political views. Most importantly, remember that other people’s emotions are their own, not yours. Anger and fear are the most common emotions that we encounter when dealing with political debate. People may feel anger over what is currently broken in our government and what they believe needs to be fixed. People may also experience fear about the uncertainty of how each candidate will handle the problems that our nation faces. Anger and fear are negative emotions, just like sadness. As you may have read in our article New Research Reveals You Only Have Four Emotions, Not Six, the only other emotion is happiness. Letting go of political stress is similar to how positive people handle any kind of stress; they choose happiness. In that moment after we hear someone speak, we have a choice of whether to respond or react and also how we will communicate our meaning to the speaker. Positive people choose their own well-being and they respond calmly, with happiness in their voices over reacting with anger and fear. When you hear conflicting information, take a moment and Google a reliable, trustworthy source of information on the topic. Not everyone understands the subtleties of international relations in diplomacy and how best to solve the crisis there. It’s easier and less stressful to deflect a political argument by acknowledging that you are not an expert on the topic, and that you will be happy to read more about it so that you can have an intelligent discussion in the future. Avoid political stress by limiting your time spent listening to anyone who frequently gives you ‘bad’ gut feelings. Ask yourself, ‘Is this person using words that are intended to scare or anger me?’ If the answer is yes, use that information to help you sort through truth versus emotionally inciting words. In a study of voter cortisol levels during the 2008 election found that those whose candidate lost the election had higher levels of the stress hormone in their saliva afterwards. By choosing how you respond to political ‘bad news,’ you can limit the negative health impact of stress on your body. Excess cortisol is bad for your health, period. High cortisol levels can lead to numerous diseases and even premature death. Avoiding conversations or situations that raise your cortisol levels may be best for your health. Alternatively, you can find a productive way to respond to angry political discussions by reading our article 7 Ways to Respond to Verbally Aggressive People. Reducing stress by responding calmly is one way that you can take control of your health this political season. 4. Avoid getting into a dominance competition. An election is a competition of two or more people vying for dominance. 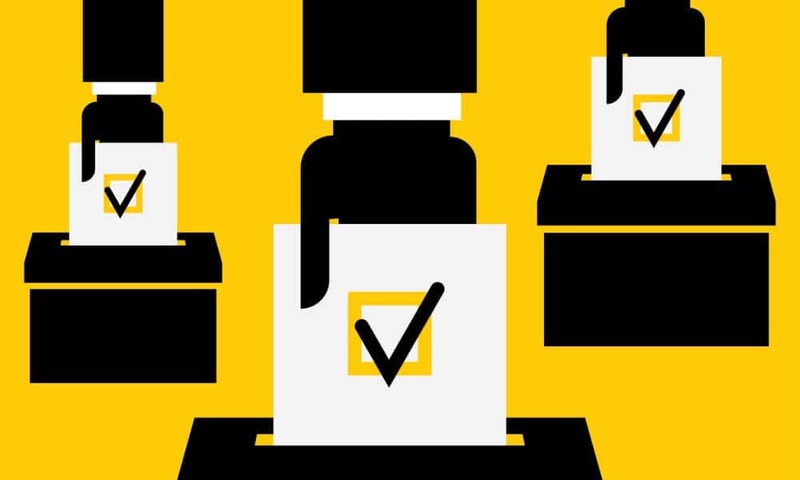 The voters often feel as though they are also engaged in this competition by having to defend their candidate of choice to others and demonstrating why their choice is the better one. Just like in the cortisol study, researchers studying the effects of elections on testosterone levels in men and women found that the levels of the aggression and dominance hormone were lower for men whose candidates lost the election. Women showed no difference in testosterone levels before or after an election, even though they naturally have small amounts of the hormone.